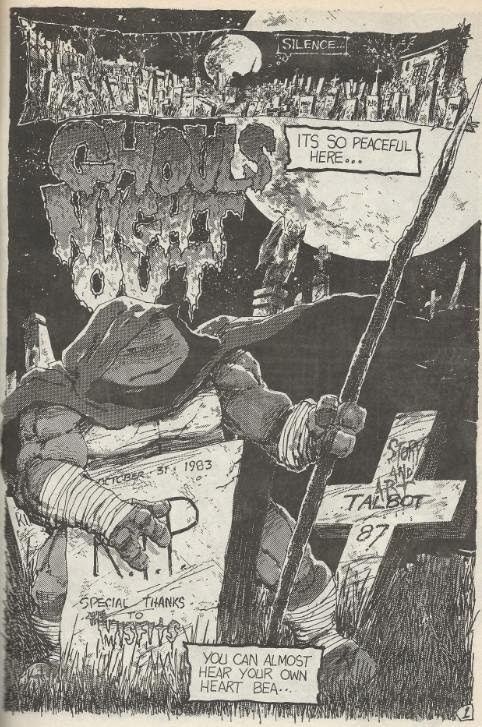 Out in a graveyard in the middle of the night, a cloaked Donatello carrying a crude spear remarks how silent everything seems to be. The serenity is disturbed by a legion of zombies who come crawling out of their own graves. Don takes flight, only to slam face-first into the gruesome form of the Frankenstein monster! Don breaks his spear over the monster’s face, but it yields no effect. Don flees once more, but quickly trips over a root in the ground and takes a tumble down a steep cliff. Don recovers just in time to be besieged by a Count Orlock-looking vampire who goes straight for his throat. Don’s days look numbered until the vampire is crushed beneath the plummeting Frankenstein monster and zombie horde, who leapt right off the cliff in their pursuit of Don. As Don makes his escape, he childishly antagonizes his undead pursuers, which was probably a poor decision, as he fails to notice the hulking werewolf who plucks him up by his cloak. Don nails the werewolf in the jaw with an uppercut, but by the time he gets his feet back on the ground, he is swarmed by the monsters. And then things start to get really weird, as Don plummets down an unseen abyss only to be attacked by a monstrous soda, burger and fries! *The headstones contain a number of references. James Hetfield, Lars Ulrich, Kirk Hammett and Cliff Burton of Metallica can be spotted, as can Glenn Danzig, Jerry Only and Paul Doyle Caiafa of The Misfits. Not sure who “Parent” or “Bridgman” are supposed to be. There’s also comic artists Berni Wrightson, Frank Frazetta, Steve Lavigne, Ryan Brown, Steve Bissette, Michael Dooney, Jim Lawson, Kevin Eastman and Peter Laird. Take a guess where most of those names came from. *Stephen Murphy’s name was added to a blank headstone in the “Shell Shock” printing. *The original printing of this story featured several type-os that were corrected for the “Shell Shock” printing: “It’s” is missing an apostrophe on page 1, “Who’s” is missing an apostrophe on page 2 and “too” is spelled “to” on page 8. 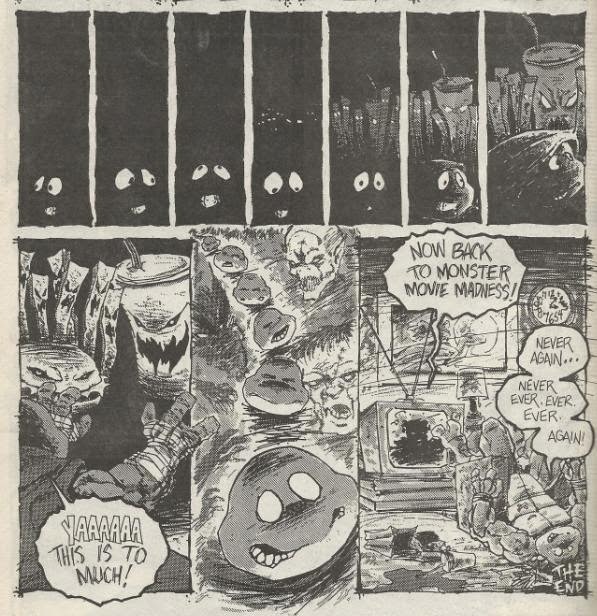 As with “The Howl” and “Not One Word!”, “Ghouls Night Out” is a back-up strip that holds up strictly on the strength of Eric Talbot’s art. I’ve yammered on before about how much I love his horror-centric stuff, so “Ghouls Night Out” ranks as a favorite of mine, as Talbot really lets loose drawing whatever classic movie monster he feels like. Talbot doesn’t disappoint, either, as he nails every creature he pencils, with the Count Orlock-looking vampire being perhaps my favorite. Don seems to act strangely out of character here, as I’ve never known him to watch horror movie marathons or childishly tease opponents like this. 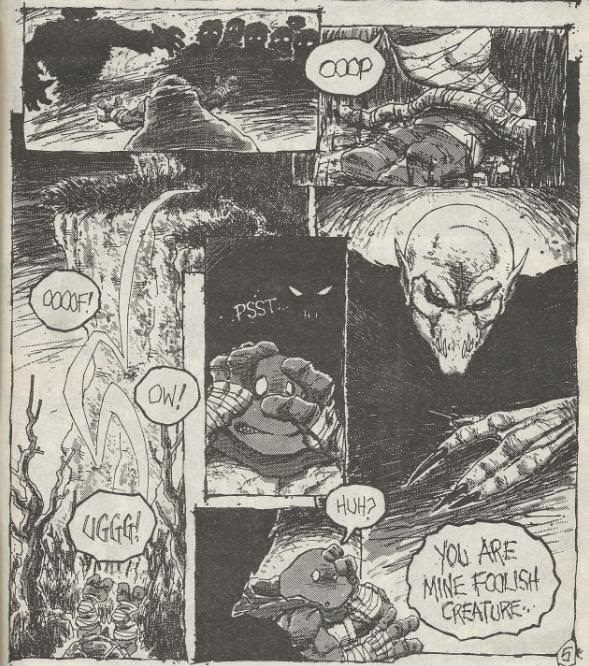 In fact, I’d be more inclined to think this was Mikey, as my only reasoning for describing the lead Turtle as Don was the presence of the staff-like spear in his hands. Overall, this is an exceedingly well-drawn back-up and worth picking up a copy of TMNT (Vol. 1) #5 for it. Though, in reality, you’d be better off tracking down a reasonably-priced copy of “Shell Shock”, instead, as it contains this back-up as well as many others (including the aforementioned Talbot piece, “The Howl”, which really feels like a companion to this one). i always like to read the turtles tips!!! good work! Please add the headstones naming Glenn Danzig, Jerry Only and Paul Doyle Caiafa of the famous Horrorpunk band "The Misfits" to the turtle tips! Great review though! My guess would be that the "Hammet" and "Burton" tombstones are making reference to the rest of the Metallica line-up back in that era. I'm reading the complete Mirage series in chronological order guided by your blog. Great work, much appreciated! Good call on the Metallica members! I'll update the Turtle Tips with that.